A couple of weeks ago, I received a Choose You Healthy Gift bag on behalf of The American Cancer Society. As a 7 year survivor of Cervical Cancer, this is a subject in which I am very interested and wish to share the word. I've made significant lifestyle changes since then, and as we all should be, am constantly evolving, becoming healthier. The gift bag I received had a $10 gift card to Walgreen's, a cool aluminum water bottle, a Choose You T-shirt, Flower Hair Clip, Flower pin, Neutrogena Age Shield sunblock, Sprite Zero coupon, and a Choose You pen. I apologize I don't have a photo, but I dismantled most of the gift bag prior to posting this! Choose You is a movement which encourages women to put our own health first in the fight against cancer. The American Cancer Society, the nation’s largest voluntary health organization, launched a new nationwide movement to shine the spotlight on a sobering statistic: one in three women will get cancer in her lifetime. Choose You (www.chooseyou.com) is designed to inspire women to take action and put their health first in order to stay well and help prevent cancer. Actress Ellen Pompeo, star of “Grey’s Anatomy”, kicked-off the American Cancer Society’s Choose You initiative on May 4th at an event in Times Square, along with national presenting sponsors Sprite Zero and Walgreens. Pompeo “powered up” the Choose You flower icon on the world’s largest digital sign, the Walgreens Times Square Billboard. The event marked the start of the nationwide effort to encourage women across the country to do something they almost never do – to “choose themselves first” so they can stay well and reduce their risk of cancer. According to the American Cancer Society, about half of all cancer deaths could be prevented if people maintained a healthy weight through diet and regular exercise; avoided tobacco products; and got recommended cancer screening tests. Unfortunately, it’s not always easy to incorporate these healthy behaviors into a busy lifestyle. In fact, a new national survey of approximately 2,000 women ages 25-64 revealed that they are so busy being caretakers of others, they have little time to take care of their own health. When asked to pick one day to focus on themselves and their health each year, the majority of women (65 percent) chose their birthday. 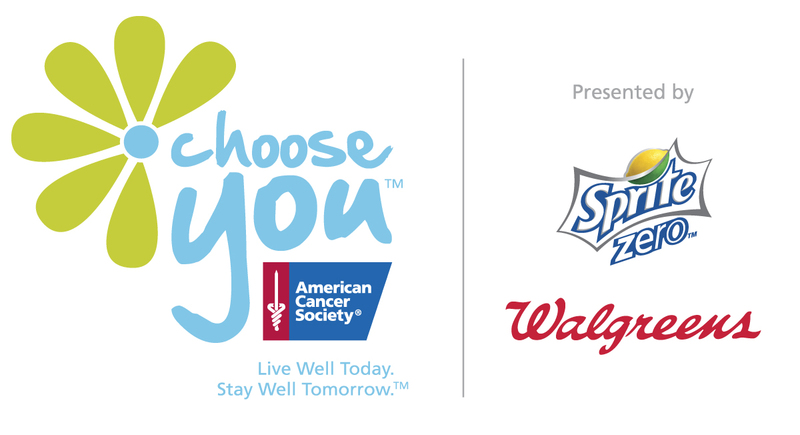 By empowering women with the tools and resources to take care of themselves and help prevent cancer, the Choose You movement is another way the American Cancer Society -- the official sponsor of birthdays -- is helping to create a world with less cancer and more birthdays. As part of the Choose You movement, women are encouraged to sign a Choose You Commitment, an online pledge to reach a specific, individual health goal. At ChooseYou.com, women can choose from five different health categories: Eat Right; Get Active; Get Recommended Health Screenings; Protect Your Skin; and Quit Smoking. Participants give a minimum five dollar pledge once they sign a Choose You Commitment to incentivize them to stay on track. They can also ask friends and family to support them. Scientific research suggests that women who have a “stake in the game”, as well as social support from friends and family are more likely to be successful at accomplishing personal health goals. Choose You participants and visitors to ChooseYou.com will have access to online support and tools such as a calorie calculator, virtual dietitian, nutrition and activity quiz, smoking cost calculator, prevention and early detection videos, and a desktop helper with daily health tips. National sponsor Sprite Zero will launch new advertising to raise awareness of the Choose You initiative. The new digital and billboard ads will appear across the country starting in May and will feature the tagline, “The Choice Is Clear”, with information on the brand’s zero sugar and no caffeine benefits. Sprite Zero is also supporting the Choose You launch through product sampling and couponing. National sponsor Walgreens, through its stores nationwide, will be offering discounts on products to help women live well and put their health first. 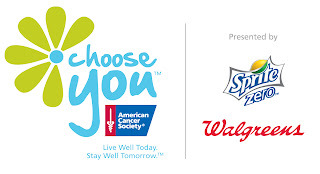 Additionally, throughout the month of May, Walgreens customers will have the opportunity to support Choose You with a “scannable” donation at check-out. For more information about the Choose You movement, log on to ChooseYou.com. One lucky winner will receive a Healthy Lifestyle Gift Bag - containing the items I indicated above. This giveaway is open to all US Residents ages 18 and up. This giveaway will end on 6/28/10. Winner will be contacted via email and will be posted on this site, so please leave your email address. Winner will have 48 hours to claim their prize or will forfeit their prize. To maintain a healthy lifestyle I make sure to drink lots of water, especially during the hot summer months like now. Not to sound like a copycat of the pp, but drink lots of water. Many things can be signs of dehydration, so stay hydrated! And, since it's 90 out today, it's not too hard to guzzle some water down. I entered your Family Dollar giveaway. Shop the outside edges of the supermarket...get fresh lean meat, veggies, and fruit, and avoid the processed, high fat, high sugar stuff in the middle. Ironically I think...I entered the Betty Crocker giveaway. cdziuba@aol.com A good tip is to leave an ice cold pitcher of water on the kitchen counter so that everyone has easy access to water all day and night, I even put sliced lemons into our pitcher. I meant to say I entered Infiniti!!! My best advice is to stop eating after 8pm, stay hydrated, and to cut soda intake. Exercise regularly! Not only is it good for you physically but mentally! I am down to 1 soda a day so i'm trying to eleminate those. Being active alot of days this is something forced due to bouts of depression but as long as i do it maybe it will offset the other eventually, and eleminating fried foods. Eat healthy and stay active as often as possible to be healthy. Make a schedule for yourself to work out and when you accomplish your goals treat yourself. By doing this you will likely stick to your goals. Take a walk after dinner then relax in a bubble bath before bed. Eat your fruit and vegetables make smoothies they fill you up and are packed with vitamins and calcium too. Cut caffienated drinks out of your diet, drink more water! To live a healthy lifestyle is to drink your water,eat food in a 50 mile area and cook fresh food from a garden! Have a cup of green tea in the evening ,what I do is brew the tea and put in the fridge so instead of drinking plain water drink iced green tea! Use a sunscreen when you go outside and laugh often! The only tip I can think of right now is to exercise. Just a little a day can keep you healthy. I don't always follow that. Walk for fitness, at least 30 minutes a day. tip: eat a lot of yougurt! Eat healthy, excercise each day, and get enough sleep to mainatain a positive and healthy life style. Get enough sleep & take care of yourself as well as those you love. Eat well,get enough sleep and exercize daily. My tip is to exercise regularly!